McLauchlan's Cycle Shop and the Woman in Red. 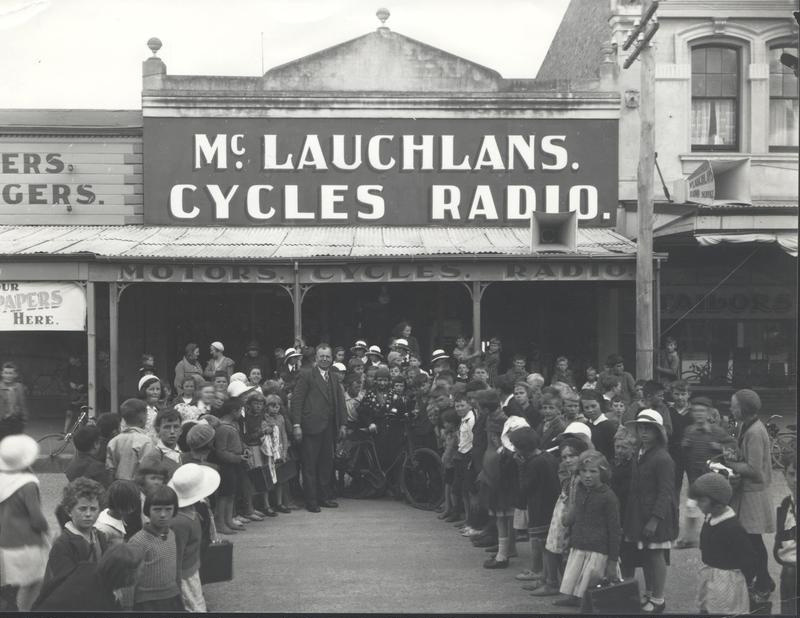 The 'Girl in Red' is welcomed to Waimate outside McLauchlan's Cycle shop, circa 1936. The 'Girl in Red', Nita Rosslyn, was a trained singer and toured the world with her show - 'Variety on a bike'. Suspicion was aroused when she refused to remove her hat or be parted from her bicycle, and doubts surfaced as to whether she was a woman. 'Was she mapping the coastline or was she a spy?' Several ideas did the rounds in those worrying pre-World War II days. Our archives file contains more information about the 'Girl in Red'. Our mother Elizabeth Waller (née Shand) tells the story of whilst she was at Nelson College for Girls, she clambered over the corrugated iron fence to seek out the lady in red, who was being hosted by the Walkers next to the school. Being inquisitive, Elizabeth had read about this mystery woman who travelled on her red bike all around New Zealand, supposedly as an envoy from the mayors of England to the various towns of New Zealnd, so Elizabeth wanted to get her autograph. Having knocked at the door she asked if the lady in red was there and if she could see her. The lady in red came straight to the door and obliged with the autograph. Elizabeth snuck back over the fence to the boarding house to show off the prized signature, only to be met by prefect Olwyn 'tell tale' Pitt who had told the principal of Elizabeth's escapade. The principal questioned Elizabeth as to where she'd been and Elizabeth very proudly said I have met the lady in red and I have her signature. Elizabeth recalls it all so vividly as she had to hand over the autograph thinking she had created excitement, but actually created trouble in a big way as far as the principal was concerned and was demoted to rooming with the 3rd form till the rest of the term. Of course the 3rd formers couldn't get enough of Elizabeth's adventurous spirit. Elizabeth had no idea that the 'woman' was a spy until she read in the newspaper a few days later, that the lady in red had come off her bike in Waimate, whereupon she was admitted to hospital, and they found her to be a man and a suspected spy. Maps had been secretly concealed in the bike's handle bars. The lady in red's cover was blown and the mystery still abounds as to what happened to her. The encounter is still very vivid in 98 year old Elizabeth's recollections. My mother told this same story to me just last week stating that the Lady In Red stayed with her mother Louise Carlinson in Whatawhata in the Waikato District and she also had to keep her bike in her room and there were stories that she may have been a man and could have been a spy mapping the coastline and storing the maps in the frame of her bike. 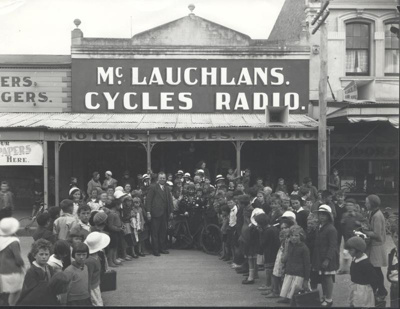 Could we have the spelling of 'McLaughan' corrected - it is McLauchlan - I am the granddaughter of Leonard Cameron McLauchlan - the man photographed beside The Lady in Red - she actually stayed at my grandparents house and the story goes that she had to have the bike in her room and that her breakfast was to be left outside the door....somewhere I do have a postcard of her. This bike shop was probably set up by my Grandfather Andrew Mclauchlan or his brother Len Mclauchlan. My grandfather had the Harley Davidson agency in Waimate until 1926 when the family shifted to Timaru. His brother Len set up the Army indian shop while in opposition (there was no firction!!). I'm not sure which shop this picture shows. Any info anyone?? Nitas bike now has pride of place in Hervey Bay, Qld hanging in the Historical Museum. She retired in Hervey Bay. Re my earlier comment - I now believe that the 'Girl in Red' may not have taken part in a bike ride with my Mum from Timaru to Christchurch. My Mum was into choral and variety type entertainment in those days and I believe she may have participated in a few shows in Christchurch. Without any proof for my beliefs, I now believe that Mum probably met up with the 'Girl In Red' on the 'Stage'. I was 6 years old when the Girl In Red stayed with us for a couple of days as guest of my Mother, Annie E Peach. I believe they had cycled together in a Timaru-to-Christchurch event. We were living at 746 Ferry Road Woolston, Christchurch at the time. I recall her bright red cycling clothing (including a close-fitting hood). My brother and I were warned not to touch her bike, which she kept in her bed-room while she was with us! (I'm referring to her in my Life Story) Do you have a photograph of her by herself? I would love to get hold of a good image.